The Identa-Label storage identification system is a cost effective and labeling system that is removable and reusable. 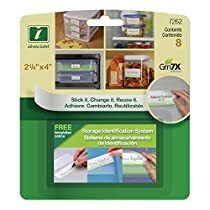 The Grn7X adhesive leaves no residue on your items. It works in hot, cold and humid conditions; and can be used in the attic, home, hobby studio, garage, basement, freezer, and any other area you can think of. These Identa-labels will stick to all materials including bins, baskets, boxes, freezer containers and many others. You can make your own inserts, it is fun and easy. Use a pen, marker, printer, photos, the options are endless. These labels will help you locate anything quickly. They can be reused over and over again, simply remove the pouch and reposition again and again or place it on a new container. Nowhere as good as they used to be. I'm extremely disappointed in these labels. I put 6 of these labels on rubbermaid bins & all of them fell off in less than an hour. I bought a pack of these at Walmart at least 5 years ago & they're still on the bins. In fact, I can barely peel them off. I'm not sure if I got a bad or old package or if the manufactured is skimping on the adhesive, but I won't be buying them again. I used to buy these label holders at Wal-Mart. I loved them but now that they are harder to find, I feel that the quality is not as good. The adhesive does not stick like it used it and I find some of them peeling off. I have others that I previously purchased and I don't have the same issue. I'm very disappointed that it is not as good as it used to be. LOVE the principle of being able to change out labels without peeling off or labeling over regular labels. Post-its tend to fall off, and I can't use the chalkboard type. The plastic 'carrier' protects the label, yet it's very easy to change out. I don't know of anything comparable that creates a neat and easy-to-use method of non-permanent labels like this. This size you can use business card stock if you want, and larger ones accommodate 3x5 cards, so you can easily make labels on printer using readily available cardstock. Deducted one star, because they don't adhere well to all surfaces, especially those that curve. Not sure if I should really deduct for that, it might not be possible to design so that it sticks 'permanently' to all types of surfaces, yet can be removed without damaging. On regular storage bins it seems to do fine. But on canisters, spray bottles, items with a slicker and somewhat rounded surface, have had to 'restick' the holder once a month or so. Didn't totally come off, but both ends want to pop up.